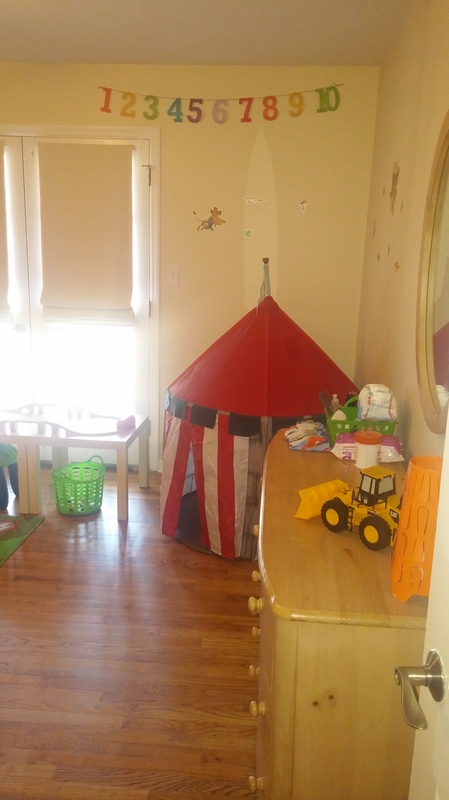 Recently my son turned 3 years old and we decided it was time for him to move to a big boy room. We were hoping the room would get him excited about moving out of the old room to make way for our new baby. We have a new baby coming this Spring and we needed to move my son down the hall. So, for his birthday we decided to give him a room makeover! 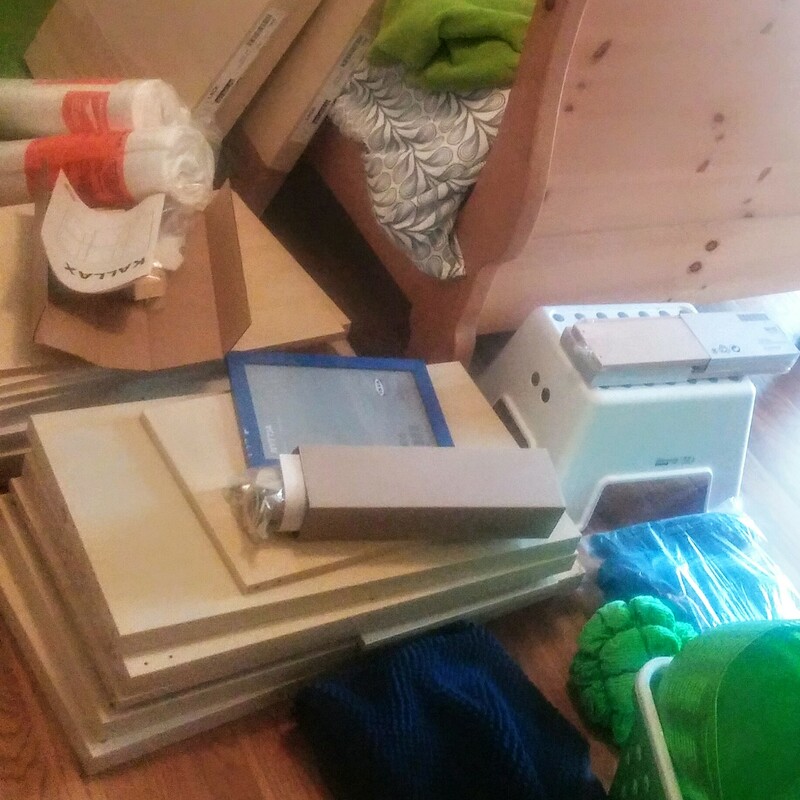 We used a lot of items that we already had and bought the rest from IKEA or Amazon. 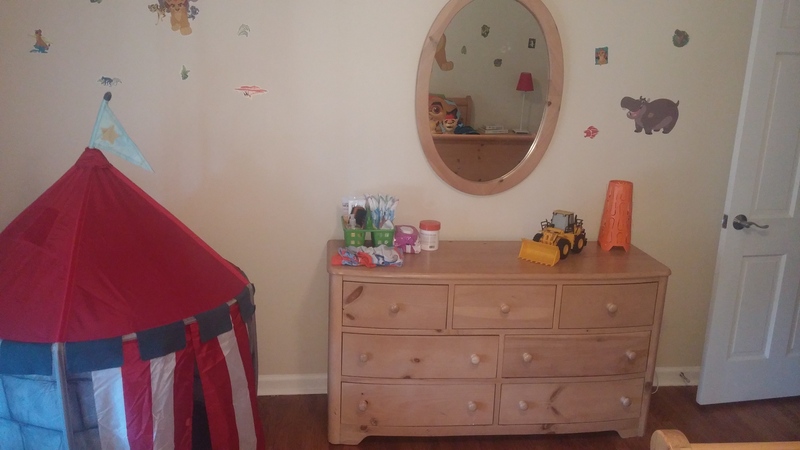 We already had a twin bed, dresser, and nightstand (these were mine as a child) plus a few other items we used for decor. So the picture above shows many of the items we purchased from IKEA (I know it looks like a mess!). 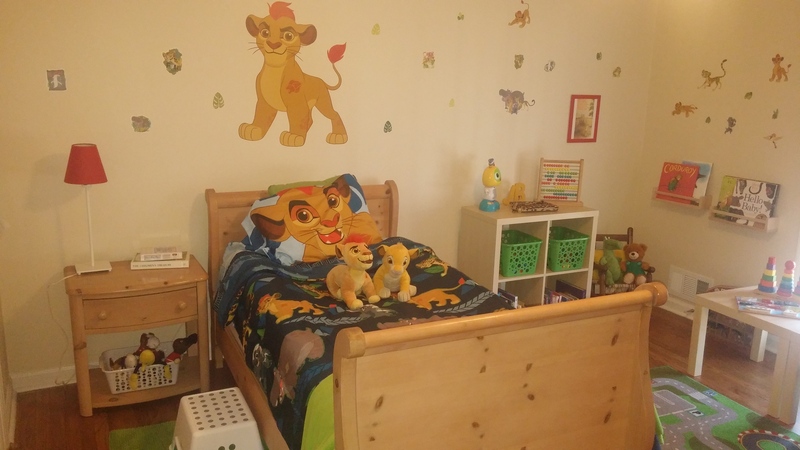 We decided to do a Lion Guard themed room since that is my son’s favorite show right now. He got a Lion Guard bedding set from my parents for his birthday, plus my husband found some great wall appliques on Amazon. His bed with the appliques on the wall. 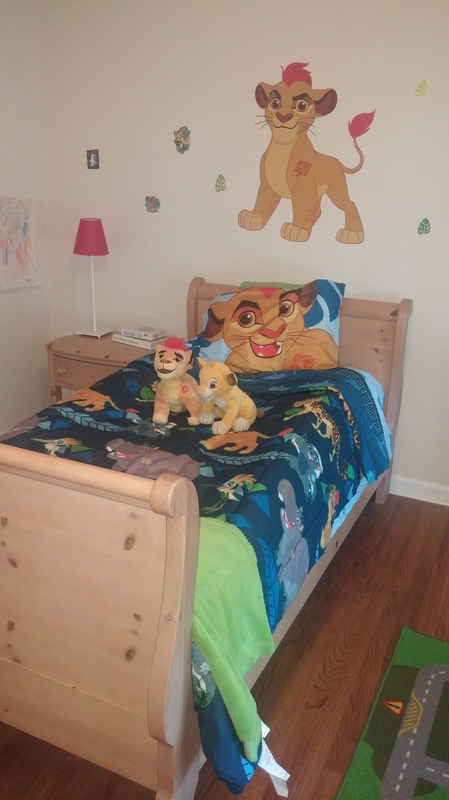 He already had Kion and Simba stuffed animals. Plus we had a green throw to add to the bed and the lamp (from IKEA) for the night stand. 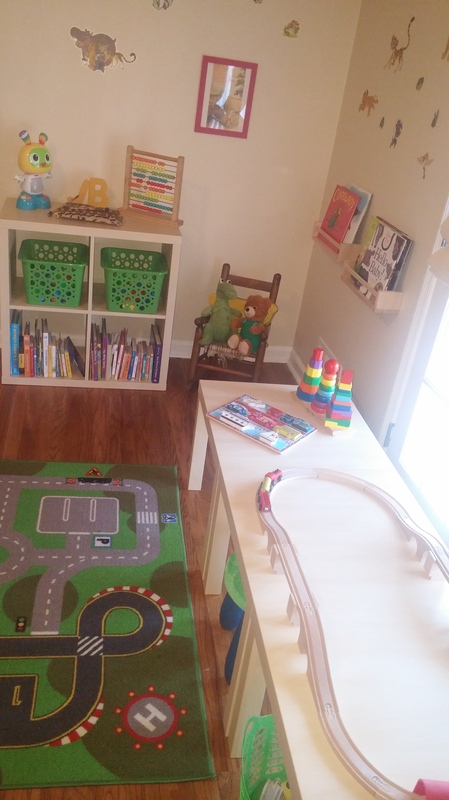 The shelf ($34.99, but we purchased during a sale) for his books and toys is from IKEA and so are the tables ($7.99) I used to make a train/play table. 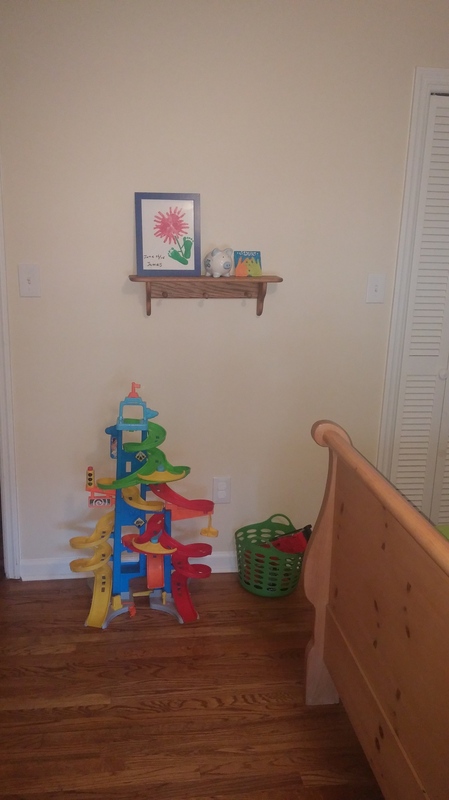 To hold his books that are on the wall, we used IKEA spice racks ($3.99)! We got his stool ($7.99) and stool cushion ($4.99) from IKEA as well. We already had the car track rug and tent (both from IKEA). The rocking chair was a hand-me-down from my mother. I added a number and alphabet banner to the wall, which we already had (purchased from the Target Bullseye Playground). The lamp on his dresser is also from IKEA and was in his old room. 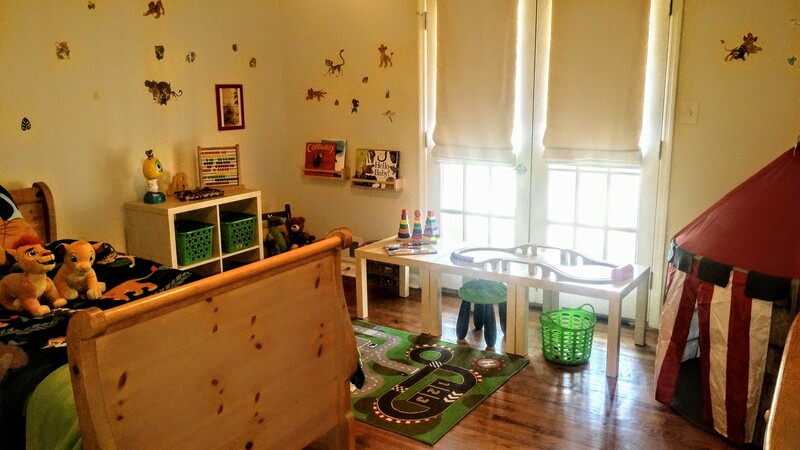 We added a few of his toys around the room because we were hoping he would want to play in his room more often. We are thinking that when the baby arrives we might need to spend more time upstairs and we wanted him to actually want to be in his room. He LOVED the room and slept in it the first night. Since our son is an early riser, we have discovered that he will even play in his room by himself in the morning until we get up and dressed. He never wanted to do that before and always wanted to come watch TV in our room.